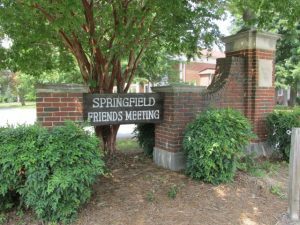 A meeting for worship was first held at Springfield in 1773. The five acres of land where our meetinghouse now stands were purchased in 1786 for the sum of five shillings. According to legend, the location was called Springfield because there were seven springs in the field below the hilltop where the meetinghouse is located. On May 1, 1790, a Monthly Meeting was set up at Springfield by New Garden Quarterly Meeting. There is no record of our first meetinghouse, but it was probably a log building. A second, larger meetinghouse was built at Springfield in 1805. A third meetinghouse was completed in 1858, with bricks made on the site. This third building, still standing, is now home to the Museum of Old Domestic Life which is visited by groups and interested individuals. Our present meetinghouse was constructed in 1927 by local contractor H.W. Thurber. The Civil War devastated the Quaker communities of the state. Quakers from all over the world joined together to help with the work of rebuilding, and Springfield became the center of the relief effort. 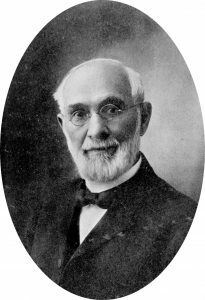 Allen Jay (1831-1910), a Quaker minister from Indiana, spent eight years in North Carolina as superintendent of the work. His energetic, tolerant and unifying spirit remains with Springfield Friends to this day. During the eight years after the Civil War, over 60 Quaker elementary schools were rebuilt. An extensive program of teacher training, outreach and evangelism helped to increase the number of Quakers in North Carolina. A model farm helped farmers from all over the state learn modern methods of agriculture, and also provided hundreds of tons of clover seed to help restore fertility to the worn-out fields. Many people know High Point as the foremost center of the nation’s furniture industry. One of the earliest factories was the Tomlinson Chair Company, founded in 1901 by the Tomlinson family who were members of Springfield Friends Meeting. One of our most influential members in the early 20th century was John Jay Blair (1860-1937) who served for many years as Director of Schoolhouse Planning for the State of North Carolina. He was the principal designer of our present meetinghouse, led a large and active Sunday School class for many years, and helped to create the Museum of Old Domestic Life as well as the Springfield Memorial Association. A skillful artist, botanist, zoologist and astronomer, he helped to found the North Carolina State Art Society. Springfield Friends was also deeply shaped by the 35 years of dedicated leadership provided by Max Rees, who served as pastor from 1961 to 1996. In 1964, a new wing was added to provide Sunday School and nursery space and a large, modern fellowship hall. Friends Emergency Material Assistance Program (FEMAP), a regional Quaker ministry which provides hygiene kits for people in natural disaster areas, infant kits and school kits for children living in impoverished communities, and farmworker’s kits for migrant workers in North Carolina and elsewhere in the U.S.
We are also well-known for our frequent meals throughout the year, which are both fund-raisers and help to build a strong sense of community. 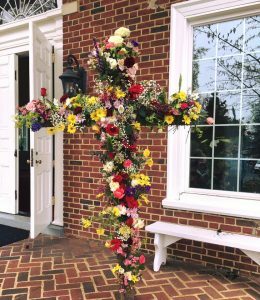 Many people at Springfield have been inspired by the Flowering Cross, a unique tradition on Easter Sunday, where a bare wooden cross is transformed as individuals attach flowers to it, until the cross which was an instrument of death becomes a symbol of life and beauty. Springfield Friends have always supported education, especially Guilford College, a 4-year Quaker college in nearby Greensboro.